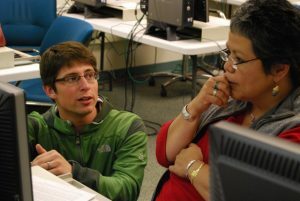 We trained staff members from the Alaska Native Tribal Health Consortium to create, teach and promote digital storytelling in their communities. After creating their own stories, those participants had opportunities to work as Creative Narrations co-facilitators and coaches during a “Train-the-Trainer” series of workshops that followed. They have since gone on to facilitate dozens of trainings on their own throughout Alaska. The stories created by ANTHC are being used in community meetings and workshops to promote healthy lifestyles throughout Alaska and to raise awareness of the real public health issues facing Native families in this region.